Chestnuts are both botanical and culinary nuts. 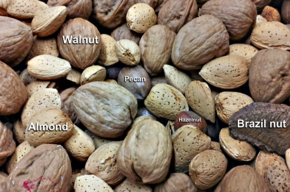 Some common "culinary nuts", including hazelnuts (which are also botanical nuts), Brazil nuts (which are not botanical nuts, but rather seeds of a capsule), walnuts, pecans, and almonds (all three of which are not botanical nuts but rather the seeds of drupes). A nut is a fruit composed of an inedible hard shell and a seed, which is generally edible. In general usage, a wide variety of dried seeds are called nuts, but in a botanical context "nut" implies that the shell does not open to release the seed (indehiscent). The translation of "nut" in certain languages frequently requires paraphrases, as the word is ambiguous. Most seeds come from fruits that naturally free themselves from the shell, unlike nuts such as hazelnuts, chestnuts, and acorns, which have hard shell walls and originate from a compound ovary. The general and original usage of the term is less restrictive, and many nuts (in the culinary sense), such as almonds, pecans, pistachios, walnuts, and Brazil nuts, are not nuts in a botanical sense. Common usage of the term often refers to any hard-walled, edible kernel as a nut. Nuts are an energy-dense and nutrient-rich food source. A nut in botany is a simple dry fruit in which the ovary wall becomes increasingly hard as it matures, and where the seed remains unattached or free within the ovary wall. Most nuts come from the pistils with inferior ovaries (see flower) and all are indehiscent (not opening at maturity). True nuts are produced, for example, by some plant families of the order Fagales. A small nut may be called a "nutlet". In botany, this term specifically refers to a pyrena or pyrene, which is a seed covered by a stony layer, such as the kernel of a drupe. Walnuts and hickories (Juglandaceae) have fruits that are difficult to classify. They are considered to be nuts under some definitions, but are also referred to as drupaceous nuts. "Tryma" is a specialized term for hickory fruits. In common use, a "tree nut" is, as the name implies, any nut coming from a tree. This most often comes up regarding allergies, where some people are allergic specifically to peanuts (which are not tree nuts), others to a wider range of nuts that grow in trees. Nuts are an important source of nutrients for both humans and wildlife. Because nuts generally have a high oil content, they are a highly prized food and energy source. A large number of seeds are edible by humans and used in cooking, eaten raw, sprouted, or roasted as a snack food, or pressed for oil that is used in cookery and cosmetics. Nuts used for food, whether true nut or not, are among the most common food allergens. Raw mixed nuts, sold as a snack food. This is a "fancy" mix, meaning that it does not include peanuts. Almonds are the edible seeds of drupe fruits – the leathery "flesh" is removed at harvest. Brazil nut is the seed from a capsule. Candlenut (used for oil) is a seed. Cashew is the seed of a drupe fruit with an accessory fruit. Macadamia is a creamy white kernel of a follicle type fruit. Peanut is a seed and from a legume type fruit (of the family Fabaceae). Pecan is the seed of a drupe fruit. Pili nut is the seed of the tropical tree Canarium ovatum which grows in the Philippines, Indonesia and Papua New Guinea. Pine nut is the seed of several species of pine (coniferous trees). Pistachio is the partly dehiscent seed of a thin-shelled drupe. Walnut (Juglans) is the seed of a drupe fruit. Yeheb nut is the seed of a desert bush, Cordeauxia edulis. Nuts are the source of energy and nutrients for the new plant. They contain a relatively large quantity of calories, essential unsaturated and monounsaturated fats including linoleic acid and linolenic acid, vitamins, and essential amino acids. Many nuts are good sources of vitamin E, vitamin B2, folate, fiber, and the essential minerals magnesium, phosphorus, potassium, copper, and selenium. Nuts are most healthy in their raw unroasted form because roasting can significantly damage and destroy fats during the process. A graph detailing the nutritional properties of nuts and oily seeds. This table lists the percentage of various nutrients in four unroasted seeds. Nuts are under preliminary research to assess whether their consumption may lower risk for some diseases, such as cardiovascular diseases and cancer. Nuts have a low glycemic index (GI) due to their high unsaturated fat and protein content and relatively low carbohydrate content. The nut of the horse-chestnut tree (Aesculus species, especially Aesculus hippocastanum), is called a conker in the British Isles. 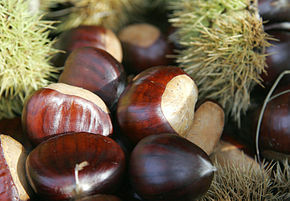 Conkers are inedible to humans and many animals because they contain toxic glucoside aesculin. They are used in a popular children's game, known as conkers, where the nuts are threaded onto a strong cord and then each contestant attempts to break their opponent's conker by hitting it with their own. Horse chestnuts are also popular slingshot ammunition. ^ Alasalvar, Cesarettin; Shahidi, Fereidoon. Tree Nuts: Composition, Phytochemicals, and Health Effects (Nutraceutical Science and Technology). CRC. p. 143. ISBN 978-0-8493-3735-2. ^ Black, Michael H.; Halmer, Peter (2006). The encyclopedia of seeds: science, technology and uses. Wallingford, UK: CABI. p. 228. ISBN 978-0-85199-723-0. ^ a b c d e f g h "Nuts". Micronutrient Information Center, Linus Pauling Institute, Oregon State University, Corvallis, OR. 1 September 2018. Retrieved 28 March 2019. ^ "Common Food Allergens". Food Allergy & Anaphylaxis Network. Archived from the original on 2007-06-13. Retrieved 2007-06-24. ^ Lina Sequeira. Certificate Biology 3. East African Publishers. pp. 130–. ISBN 978-9966-25-331-6. Retrieved 29 July 2010. ^ Kris-Etherton PM, Yu-Poth S, Sabaté J, Ratcliffe HE, Zhao G, Etherton TD (1999). "Nuts and their bioactive constituents: effects on serum lipids and other factors that affect disease risk". Am J Clin Nutr. 70 (3 Suppl): 504S–511S. doi:10.1093/ajcn/70.3.504s. PMID 10479223. ^ "The Difference Between Raw, Pasteurized and Roasted Almonds". Legendary Foods. Archived from the original on 2016-10-06. ^ Aune, D; Keum, N; Giovannucci, E; Fadnes, LT; Boffetta, P; Greenwood, DC; Tonstad, S; Vatten, LJ; Riboli, E; Norat, T (5 December 2016). "Nut consumption and risk of cardiovascular disease, total cancer, all-cause and cause-specific mortality: a systematic review and dose-response meta-analysis of prospective studies". BMC Medicine. 14 (1): 207. doi:10.1186/s12916-016-0730-3. PMC 5137221. PMID 27916000. ^ Luo, C; Zhang, Y; Ding, Y; Shan, Z; Chen, S; Yu, M; Hu, FB; Liu, L (July 2014). "Nut consumption and risk of type 2 diabetes, cardiovascular disease, and all-cause mortality: a systematic review and meta-analysis". The American Journal of Clinical Nutrition. 100 (1): 256–69. doi:10.3945/ajcn.113.076109. PMID 24847854. ^ David Mendosa (2002). "Revised International Table of Glycemic Index (GI) and Glycemic Load (GL) Values". Retrieved 2007-11-23. Wikimedia Commons has media related to Nuts.